Prime Minister Stephen Harper calls the gunman a "terrorist"
(CNN) -- First a soldier guarding a hallowed war memorial was gunned down in Canada's capital. Then shots erupted in the halls of the country's Parliament minutes later. 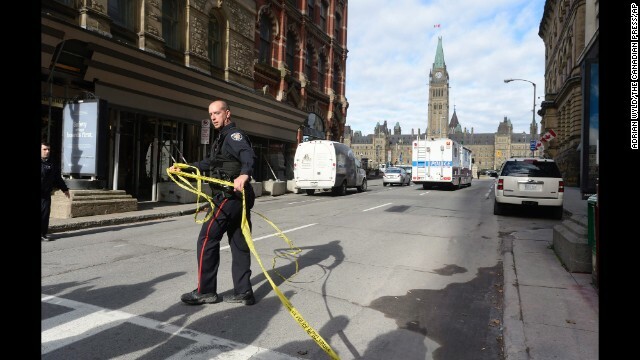 The two shootings in Ottawa Wednesday left lawmakers barricaded inside offices and parts of the city on lockdown for hours as police searched for suspects. Ottawa Police lifted the lockdown Wednesday night and said there was no longer a danger to the public. But many questions remain about the shootings: Who was the gunman? Why did he open fire? And was he acting alone? Cpl. Nathan Cirillo on Sunday. 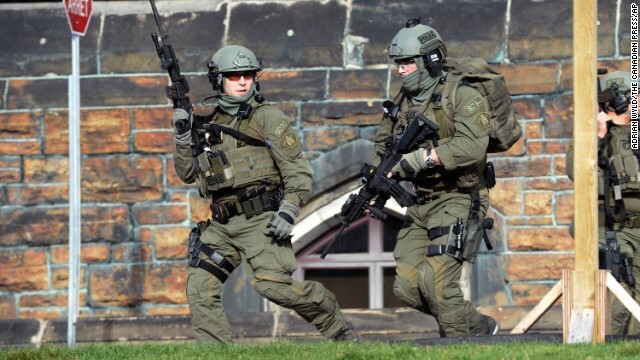 Police enter Canada's Parliament building on Wednesday, October 22, in Ottawa. 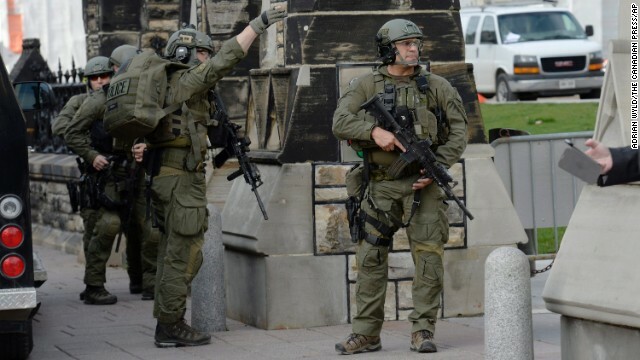 A Canadian soldier was fatally shot at the National War Memorial nearby, and there were gunshots at the Parliament building itself, Ottawa police spokesman Marc Soucy said. One male suspect was also killed, police said. 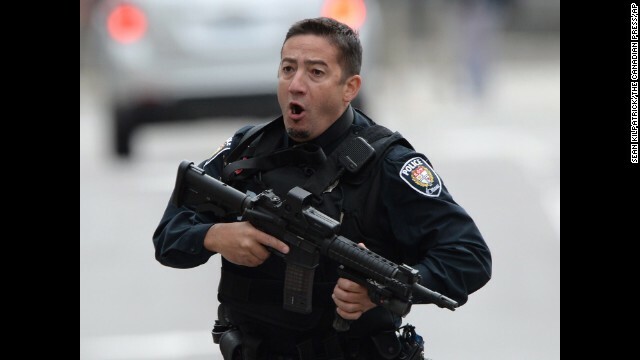 A police officer runs with his weapon drawn outside Parliament Hill. Police personnel clear the area at the entrance of Parliament Hill. Civilians leave a secured area around Parliament Hill. Police move toward the Parliament building. 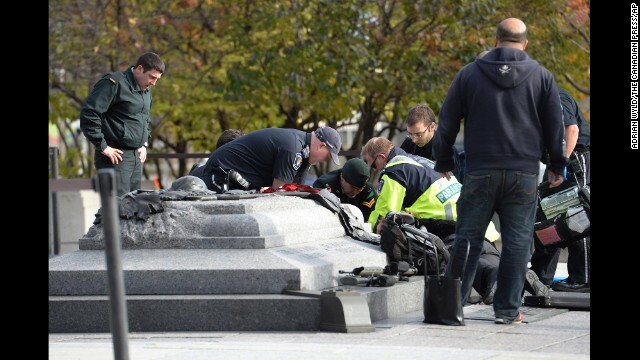 Emergency personnel tend to a person who was shot at the National War Memorial. Cpl. Nathan Cirillo, a Canadian army reservist, was shot and killed as he and another soldier stood guard at the memorial, police said. Royal Canadian Mounted Police respond to the scene. Paramedics and police pull a shooting victim away from the war memorial. 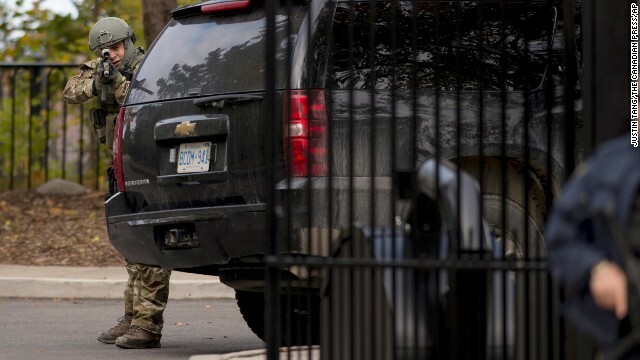 A heavily armed officer takes position at the gate of 24 Sussex Drive, the official residence of Canadian Prime Minister Stephen Harper. 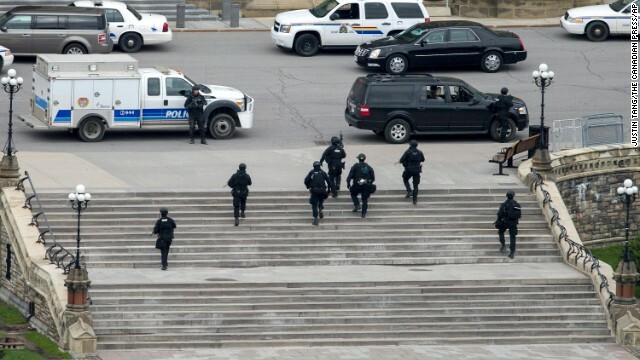 Harper was evacuated from the Parliament building, his press secretary tweeted. Police cordon off a street leading to Parliament Hill. Police walk past a gate on Parliament Hill. A police officer secures the scene. Police and medical personnel work at the scene of the shooting at the war memorial. 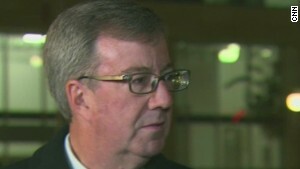 "It appears there was just one shooter, and that shooter is dead," Ottawa Mayor Jim Watson told CNN's Anderson Cooper. "But it has been a traumatic experience, obviously, for not only our city but the country." Investigators haven't provided any possible motives for the shooting. Canadian Prime Minister Stephen Harper didn't provide details about the investigation in a televised address to the nation Wednesday night. "In the days to come, we will learn more about the terrorist and any accomplices he may have had, but this week's events are a grim reminder that Canada is not immune to the types of terrorist attacks we have seen elsewhere in the world," Harper said. "Let there be no misunderstanding: We will not be intimidated. Canada will never be intimidated." It is unclear whether additional suspects were tied to the shootings or whether additional arrests have been made. The Royal Canadian Mounted Police said more information would be provided in a press conference Thursday. As authorities continued to investigate, details began to emerge about the man they suspect was behind the shooting. Michael Zehaf-Bibeau was identified by Canadian officials to their American counterparts as the suspected gunman, multiple U.S. officials told CNN. Bibeau, who was born in 1982, was a convert to Islam and had a history of drug use before he converted, two sources said. His passport had been confiscated by Canadian authorities when they learned he planned to go fight overseas, a U.S. law enforcement official told CNN's Susan Candiotti. The official said it was not clear when that happened. Canadian broadcaster CBC reported that Bibeau had a record of drug arrests going back 10 years. Cpl. Nathan Cirillo was "murdered in cold blood" as he stood guard at Canada's National War Memorial, Harper said, expressing condolences to the slain Canadian soldier's family. The soldier appeared to have been shot in the back, said Peter Henderson, a journalist who was at the memorial at the time of the shooting. Other soldiers who were nearby doing drills at the time ran to help, he said. Cpl. 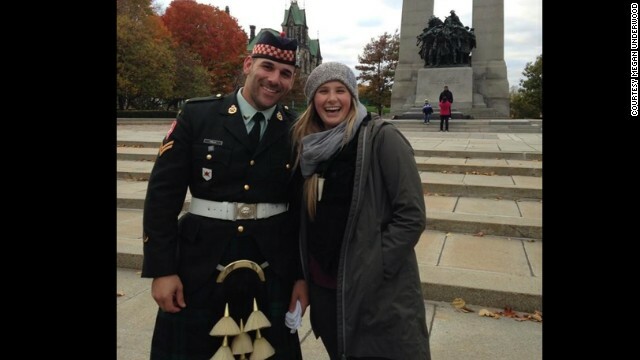 Nathan Cirillo was killed after a gunman opened fire at the Canada War Memorial. 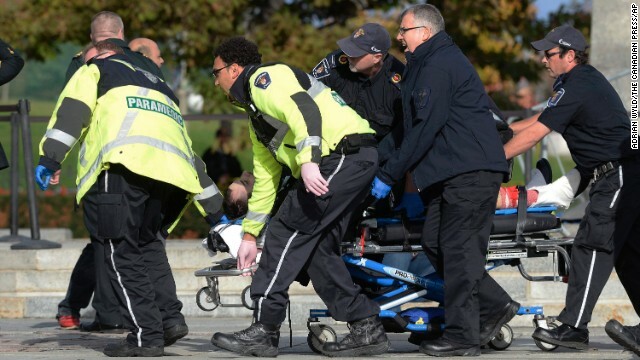 Three people brought to The Ottawa Hospital after the shootings have been released, hospital spokeswoman Hazel Harding told CNN. Earlier, they were described as being in stable condition. 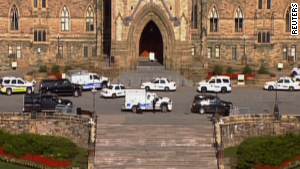 Shortly after the shooting at the memorial, a gunman entered the nearby building on Parliament Hill, officials said. "I heard rapid fire -- gunshots going very loud -- and I figure maybe 20-plus shots within 10 seconds," Canadian Deputy House Leader Kevin Lamoureux told CNN. He was one level below the gunshots. Gunfire first erupted in the building's foyer. 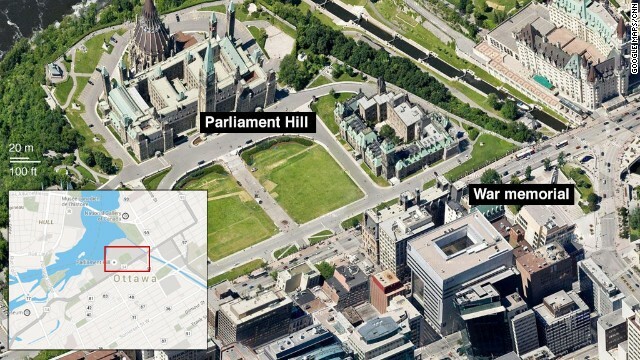 Then a second round of shooting happened about a minute later in a hallway or near the entrance to the Parliament's library, Wingrove told CNN. Several officers had weapons drawn, he said, and most of the dozens of shots that he heard appeared to have been fired by officers at the gunman. When the shooting ended, a person was lying motionless on the ground near the library entrance, Wingrove said. Parliament member James Lunney tweeted: #HOC in Lockdown, lone gunman shot security guard, shot his way down Hall of Honor....we are all safe. Gunman dead! Thnk God & our scrty!" 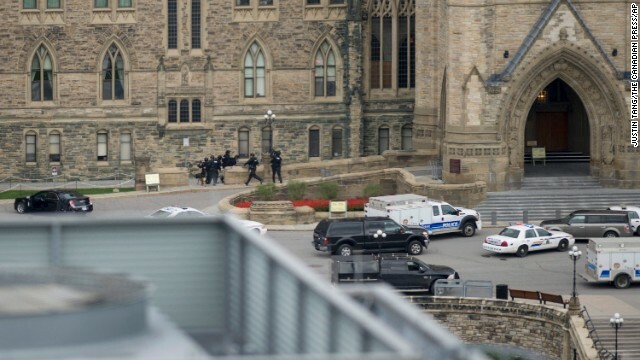 In Twitter posts, several Canadian lawmakers hailed a top security official as a hero, crediting him with shooting the gunman inside Parliament. "MPs and Hill staff owe their safety, even lives, to Sergeant at Arms Kevin Vickers who shot attacker just outside the MPs' caucus rooms," Craig Scott, a member of Parliament, wrote. A U.S. law enforcement official told CNN that a connection to terrorism hasn't been ruled out. On Monday, a man who Canadian authorities said was "radicalized" killed a Canadian soldier with his car. The man was then shot and killed. There was no immediate indication that the Monday and Wednesday incidents were related. In response to the shootings, the North American Aerospace Defense Command, or NORAD, has increased its alert posture, CNN has learned. That means that it has increased the number of planes on a higher alert status ready to respond if needed. NORAD and Canadian authorities are in contact, an official told CNN. 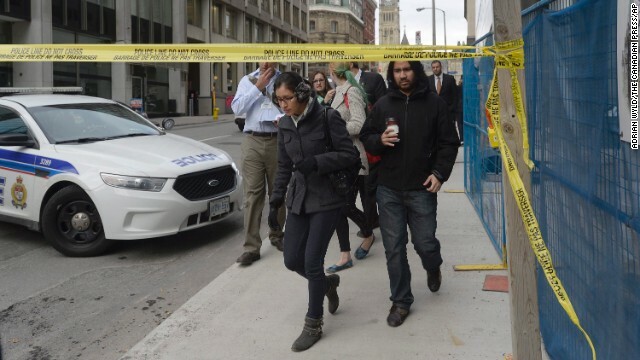 MP Tony Clement tweeted that he heard "at least 30 shots" and apparently was able to take cover with colleagues. He also tweeted that Prime Minister Harper was secure. Harper was safely evacuated from the building, tweeted his press secretary, Carl Vallee. Hours after the Parliament attack, Harper spoke by phone with U.S. President Barack Obama. "Obviously, we're all shaken by it," Obama later told reporters, "but we're going to do everything we can to make sure we're standing side by side with Canada during this difficult time." Watson said that Wednesday was "a sad and tragic day for our city and our country." "There's no pain greater than losing a loved one -- to have it happen in such circumstances as this morning is beyond expression, and underlined by a sad anger within my heart," he said. 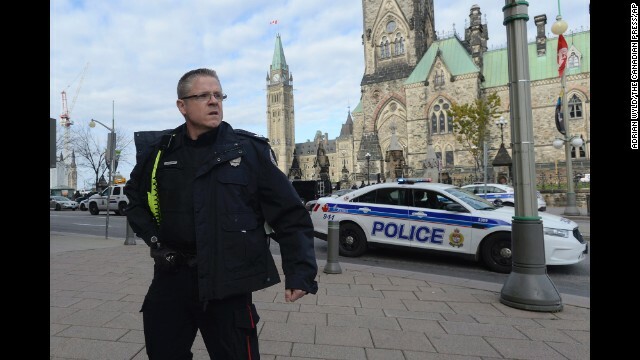 The violence at Parliament comes just days after Canada raised its terror alert Friday. The suspect in Monday's vehicle attack, Martin Rouleau Couture, reportedly converted to Islam about a year ago. Police arrested him last July and confiscated his passport, but lacked enough evidence to keep him in custody, said Martine Fontaine of the RCMP. "When he was arrested, he was about to go to Turkey," Fontaine said. 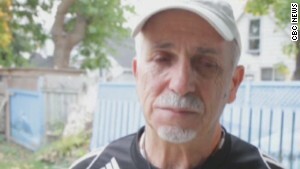 "We stopped him as he was about to leave Canada for terrorist actions. He was questioned when he was arrested. 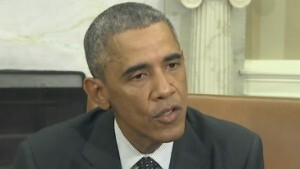 We have not been able to determine any real threat at this time." CNN's John Newsome, Pamela Brown, Jason Hanna, Dorrine Mendoza, Dana Ford, Elise Labott, Jim Sciutto, Pam Brown, Deb Feyerick and Susan Candiotti contributed to this report. After a gunman killed an army reservist in the Canadian capital of Ottawa, many questions remain. 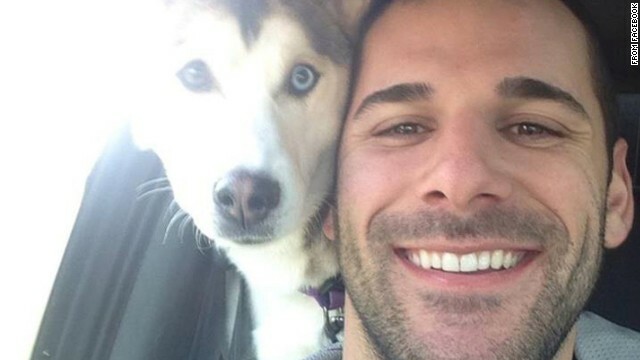 Nathan Cirillo was the strong, smiling type. Who is shooter Michael Zehaf-Bibeau? What would spur someone to walk up to a war memorial, fatally shoot a soldier guarding it, then rush into Canada's Parliament and open fire? Canadians feared this day, hoping it would never come but also knowing the odds probably weren't in their favor either. As sergeant-at-arms of Canada's House of Commons, Kevin Vickers is accustomed to being in the middle of big things. 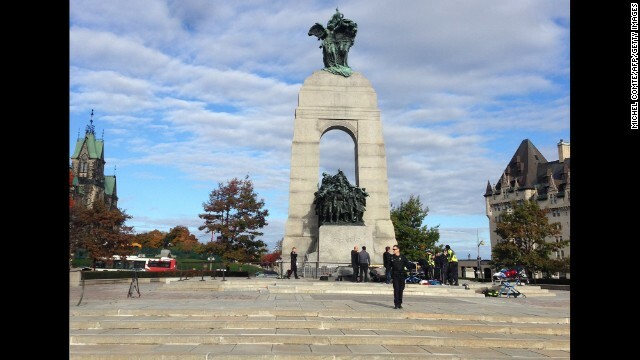 Ottawa's Guard of Honor returns to the National War Memorial following the horrific shooting of Nathan Cirillo. Opinion: How did this happen? This isn't supposed to happen in Canada. In recent days, Canada has become more involved in the global fight against ISIS. How secure is nation's parliament building? The incident has raised a concern: how secure is the nation's seat of power. Peter Henderson heard gunshots ring out from the National War Memorial as workers were rolling into the office a little late. 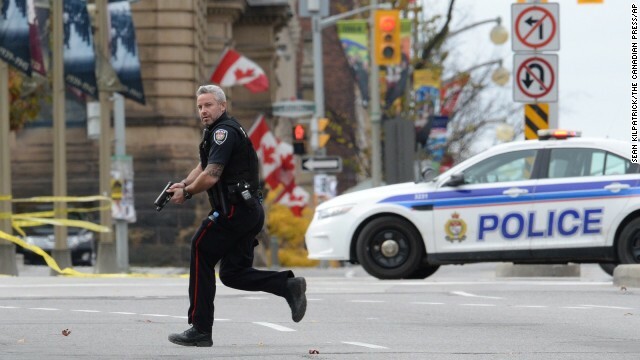 Photos as the scene unfolds of multiple shootings in Ottawa, Canada. 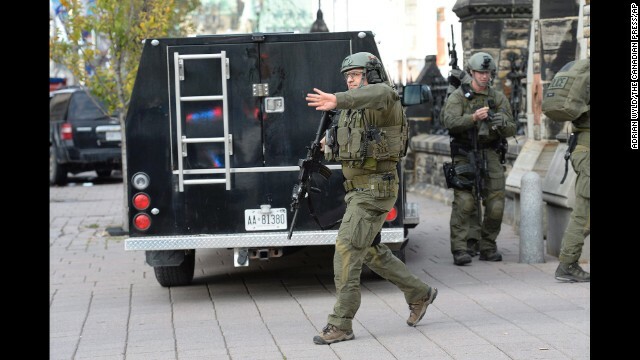 Journalist Matthew Millar describes the scene at the Ottawa Parliament building after a gunman opened fire. Video captured inside Canada's Parliament shows the chaos that ensued during a shooting incident.